The Western Region of Europe is made up of seven countries and is one of the most visited regions in the world. The strong tourism infrastructure and interlocking countries makes visiting each of these top destinations very attainable. Like tourists, drone pilots are drawn to the beautiful landscapes, architecture and history of Western Europe. 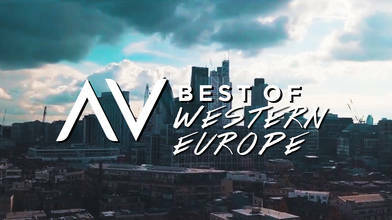 Take in some of the most breathtaking aerials of France, the United Kingdom, Luxembourg, Monaco, the Netherlands, and Belgium in this video compilation edited by AirVuz. THE WESTERN REGION OF EUROPE IS MADE UP OF SEVEN COUNTRIES AND IS ONE OF THE MOST VISITED REGIONS IN THE WORLD. THE STRONG TOURIST INFRASTRUCTURE AND INTERLOCKING COUNTRIES MAKES PLANNING A TRIP TO EACH OF THE TOP DESTINATIONS IN THIS REGION VERY ATTAINABLE. LIKE TOURISTS, DRONE PILOTS HAVE LONG BEEN DRAWN TO THE BEAUTIFUL LANDSCAPES, ARCHITECTURE AND HISTORY OF WESTERN EUROPE. TAKE IN SOME OF THE MOST BREATHTAKING AERIALS OF THE REGION AND BEGIN YOUR TRAVEL PLANNING TODAY! KNOWN AS THE WORLD'S MOST ROMANTIC CITY AND BOASTING OVER 70 MICHELIN-STARRED RESTAURANTS AND HUNDREDS OF MUSEUMS, A VISIT TO PARIS IS NEVER LONG ENOUGH. SKI, SNOWBOARD, AND HIKE AMONG SOME OF EUROPE'S BEST MOUNTAIN VIEWS AND QUAINT VILLAGES. ONE OF THE MOST VISITED SPOTS IN FRANCE, THE ISLAND CREATES AN ICONIC TIDAL REFLECTION OF THE 1,000 YEAR "GRAVITY-DEFYING" RELIGIOUS REFUGE. THEATER, HISTORICAL ATTRACTIONS, AMAZING GREEN SPACES AND A VIBRANT ATMOSPHERE ALONG THE THAMES RIVER. LONDON HAS SOMETHING FOR EVERY TYPE OF TRAVELER. A COASTAL COUNTRY AND PART OF THE UNITED KINGDOM, WALES IS KNOWN FOR ITS STUNNING NATURAL SITES. THE COUNTRYSIDE IS PERFECT FOR TRAVELERS LOOKING TO FOCUS ON THE GREAT OUTDOORS. AFFECTIONATELY KNOWN AS IRELAND'S FOODIE CAPITAL, CORK ENCAPSULATES MUCH OF THE MAGIC AND CHARM THAT HAS MADE IRELAND A TOP GLOBAL TRAVEL DESTINATION FOR YEARS. THE ROCKY COASTS AND LUSH GREEN LANDSCAPES OF IRELAND'S WEST COAST MAKE FOR AN EXCELLENT MULTI-DAY ROAD OR TRAIN TRIP - BE SURE NOT TO MISS THE CLIFFS OF MOHER. DESPITE BEING ONE THE TOP 10 SMALLEST COUNTRIES IN THE WORLD, LUXEMBOURG HAS A LARGE AMOUNT OF CASTLES TO VISIT AND TOUR. HOME OF THE MONTE CARLO GRAND PRIX AND A FAVORITE DESTINATION FOR THE EXTREMELY WEALTHY, A VISIT TO MONACO WILL HAVE YOU FEELING LIKE THE GLITTERATI. THE CAPITAL CITY OF THE NETHERLANDS IS KNOWN FOR CANALS, BIKES, ART, ITS RED LIGHT DISTRICT AND BEING ONE OF THE WORLD'S FIRST CITIES TO LEGALIZE THE USE OF RECREATIONAL MARIJUANA. A UNESCO WORLD HERITAGE SITE, THIS VILLAGE IN THE NETHERLANDS IS KNOWN FOR ITS ICONIC 18TH-CENTURY WINDMILLS AND WATER-MANAGEMENT NETWORK. THIS CHARMING, ANTIQUE TOWN HAS PRESERVED ITS MEDIEVAL ARCHITECTURE AND HISTORY SO WELL THAT THE ENTIRE CITY CENTER IS A UNESCO WORLD HERITAGE SITE. NEED ANOTHER REASON TO VISIT WESTERN EUROPE? WE'VE GOT 25! CLICK THE LINK TO VIEW THE ENTIRE COLLECTION OF AERIAL FILMS OF THE REGION. LOOKING FOR MORE REGIONAL TRAVEL INSPIRATION? VISIT AIRVUZ.COM AND VIEW 30 COLLECTIONS OF DRONE VIDEOS OF MULTI-COUNTRY REGIONS.